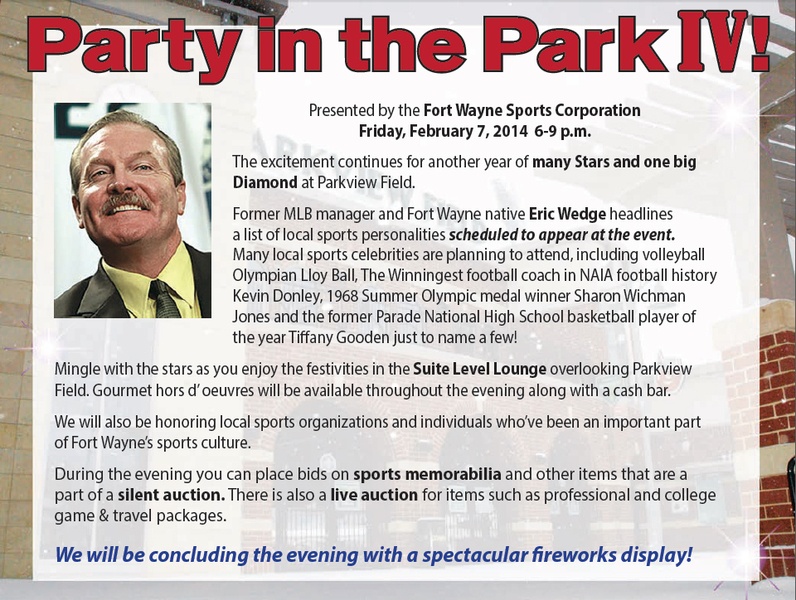 The Fort Wayne Sports Corporation's annual Party in the Park event takes place on Friday, February 7th, 2014 from 6 to 9 pm at Parkview Field. The cocktail party event is hosted by Eric Wedge and features a live and silent auction for sports memorabilia and other items, as well as college and professional game ticket packages. Come mingle with local sports greats who are expected to attend such as Lloy Ball, Jason Fabini, Kevin Donley, Tiffany Gooden, Sharon Wichman Jones, Ian Boyce and others. The FWSC will also honor selected individuals and organizations that have had a significant impact on sports in the Fort Wayne area. Join us for an enjoyable evening as we celebrate the great sport heritage of this area. The night will be capped off with a fireworks display. Proceeds from the event go the Eric & Kate Wedge Foundation and the Fort Wayne Sports Corporation. You can register for the event by downloading the invitation, filling it out and mailing it in with your payemtn, or by registering and making payment online here on our Web site (click here).